Can Government Sponsored Health Insurance Schemes (GHISs) be optimised to enhance the quality of health care in the private sector and improve public facilities? Prabal Vikram Singh and Rohini Kalvakuntla from ACCESS Health International at the Centre for Emerging Markets Solutions evaluate GHISs within the framework of Universal Health Coverage in India. The agenda of universal health care in India is driven by the concept of equitable, accessible and affordable health care for all. The objective is to protect both the poor and the non-poor from health risks and also to provide financial protection. There are several paths to achieving this goal, and the question is, which are the most viable ones? One of the obvious answers is to strengthen public facilities, right from the sub-centres and primar y health centres (PHCs) to community health centres (CHCs) and district hospitals, in order to cater to a larger segment of the population and maintain certain levels of quality. One of the inherent problems of this approach, however, especially, in India, is the lack of faith people have in the public sector due to the arguably poor quality of ser vices provided or the ver y availability of services and service providers. Alternatively, the government can act as a buyer of ser vices for those who cannot afford them and give the beneficiaries a choice of place of treatment. This option is increasingly being pursued independently and also through the health insurance route. However, the insurance route carries the obvious risk of increasing the overall cost of providing health care. health expenses on the poor. The centre or the state funds the schemes by paying a certain premium to the insurance company, or in some cases, an autonomous body formed by the government itself, which then provides insurance coverage for a set of predetermined procedures and medical conditions to the eligible population. The focus is on providing cashless ser vice to the beneficiaries through a network of empanelled hospitals (both public and private). In considering the many pros and cons of these schemes, we must also assess them on their two- pronged approach of possibly exercising control over the quality and cost of treatment in the private sector and potentially strengthening the public facilities that are empanelled with the schemes. Health care markets often do not function well, unlike markets for other goods and ser vices, due to information asymmetries, i.e., patients often rely completely on decisions made by their doctors or medical providers, making it a principal-agent relationship (Tangcharoensathien, et all 2008). These market imperfections often lead to the creation of supplier induced demand by the private sector and possibly escalate costs. While private hospitals may also be pioneers in health care research and high technology treatments, regulation and inter vention by the government is necessar y to ensure quality ser vices to improve outcomes and keep the costs down. In middle-income countries like India, where there is a large private sector presence in health care, accounting for almost 74% of all health care, inter vention is critical. Yet, in resource-constrained situations, regulation is often poor. The difficulty of designing appropriate legislative regulator y mechanisms and then actually enforcing them imposes high administrative costs on the regulator, i.e., the state. GSHIs are an indirect way of regulating private markets through an incentive-based system. The empanelment processes of these schemes have mandates on bed capacity, infrastructural requirements and quality standards with which hospitals must comply. Most schemes conduct regular checks on their network hospitals to ensure their compliance with these guidelines. This is one way of monitoring the quality of ser vices in the private sector. Most schemes have predetermined package rates for medical and surgical procedures, allowing state governments to negotiate lower prices for procedures than what people would pay out-of-pocket. Since the implementation of the Rajiv Aarogyasri scheme (aarogyasri.org) by the Andhra Pradesh government in 2007, private hospitals have earned C. 3,000 crores (~US$ 600 million). Such massive resources make ever y private hospital a potential contender for empanelment under the scheme. However, anomalies may occur where hospitals may want to empanel only for procedures for which they can conveniently recover costs as opposed to procedures where providing care at government determined prices may be more of a constraint for them. In such cases, the government must revisit those package rates. In addition, the Aarogyasri Trust (the body that administers the scheme in the state) also attains a strong bargaining position, which it can use to effectively administer the sector. Similarly, the Comprehensive Health Insurance Scheme (CHIS)1 of Kerala has expanded its scope to the above poverty line (APL) population, which pays its own premium and avails of the ser vices provided under the scheme. Thus, a larger number of people will start to use the ser vices at regulated package prices, thereby deepening the regulation of prices at private hospitals. The bargaining position of these schemes can be used for price control as well as in efforts to improve quality. The potential created by these platforms is yet to be fully explored to influence health care ser vices for the better. Considerable capacity, however, needs to be built to advance the administration of these schemes. Scheme administrators must disseminate clinical guidelines across the network of hospitals and enforce strict rules of empanelment and disempanelment to make regulation effective. Further, since most schemes operate on a package system, prices must be monitored and periodically revised to ensure that they are reasonable. The CHIS data (Chart 1A) shows a 163% and 131% increase in the utilisation of public facilities, in terms of volume and value respectively, as compared to an increase of 49% and 52% in private facilities. These numbers are expected to rise as the Comprehensive Health Insurance Agency of Kerala (CHIAK2) is focusing on empanelling more CHCs. 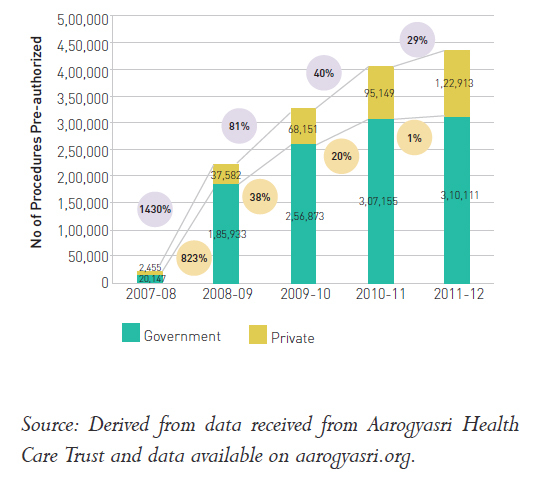 Aarogyasri shows a Compounded Annual Growth Rate (CAGR) of 166% in the utilisation of public facilities (in volume) between 2007-08 and 2011-12 as compared to a CAGR of 98% in the utilisation of private facilities during the same period (Chart 1B). In terms of value, the CAGR for public facilities is 134% as compared to the CAGR of 72% for private facilities. The incentive scheme for ever y procedure performed in public hospitals has encouraged doctors and other medical team members to be more active in their ser vices. In Aarogyasri, as per government policy, 20% of the package (except for a few packages) is deducted at source and kept in a common revolving fund. The concept of the revolving fund is unique to Aarogyasri, where 20% of the benefit money is retained by the Aarogyasri Trust to be utilised by the facilities for infrastructural improvements and the purchase of equipment. The facilities indent their requirements and the Aarogyasri Trust acts on these requests. The idea behind the revolving fund is to improve funding accountability and ensure the best possible use of the funds. For instance, in 2010-2011, C 65 crores (~US$13 million) was dedicated for the purchase of equipment for public facilities. Of the remaining 80%, 35% goes towards the payment of incentives to the performing medical team and the remaining 45% goes towards expenditures related to patient care, such as the purchase of consumables, disposables and medicines, providing special diets and transportation. In the Comprehensive Health Insurance Scheme (CHIS) of Kerala, incentives form about 25% of the benefit package; however, with increasing patient inflows into public hospitals and a gradual improvement in human resources, the administration is debating the reduction of incentives to 5%. While the incentive system seems lucrative in theor y, the internal allocation of funds from the scheme resides with hospital representatives, and doctors often do not get their share despite instructions from the scheme. An improved monitoring system and a proper grievance channel that connects hospital staff to administrators of the scheme could potentially improve this situation. It is evident that there is a need for effective administration for incentive systems to function properly. In Kerala, the Hospital Development Committee (HDC) determines how hospitals use RSBY/ CHIS money – it approves their plans for new human resource recruitments, equipment purchases or infrastructural improvements. A community health centre in Kerala (CHC Kesavapuram) claims that the RSBY/ CHIS money is a much needed infusion and that they have greater autonomy to use this money, which benefits the ser vices offered. With these funds, CHC Kesavapuram has hired extra nurses, an anaesthetist and laborator y assistants, facilitated ambulator y ser vices for patients and built an outpatient waiting area in the highly crowded CHC. Many argue that the funds for such schemes have been diverted from funds intended for the development of public health facilities. However, there is not much evidence to show that the budgets have been converted from the supply to the demand side (Forgia and Nagpal, 2012). 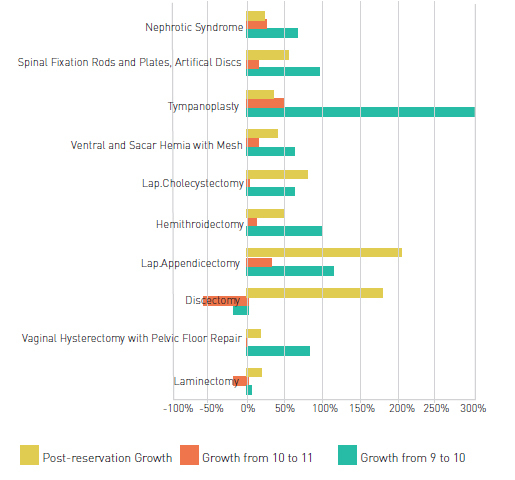 Several instances of deliberate supplier-induced demand have been obser ved in some commonly performed procedures such as hysterectomies in the Aarogyasri scheme as well as RSBY. 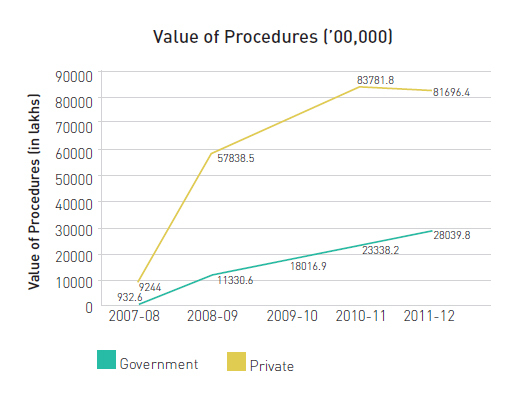 The Aarogyasri Trust issued guidelines for managing procedures of the greatest concern, but there were no major improvements. Consequently, five years after its inception, Aarogyasri reser ved about 133 common procedures to be performed exclusively in public hospitals for three main reasons – strengthening public health facilities, encouraging greater patient inflow into government teaching hospitals and reducing provider induced demand for certain high margin procedures. Source: Derived from data received from Aarogyasri Health Care Trust and data available on aarogyasri.org. 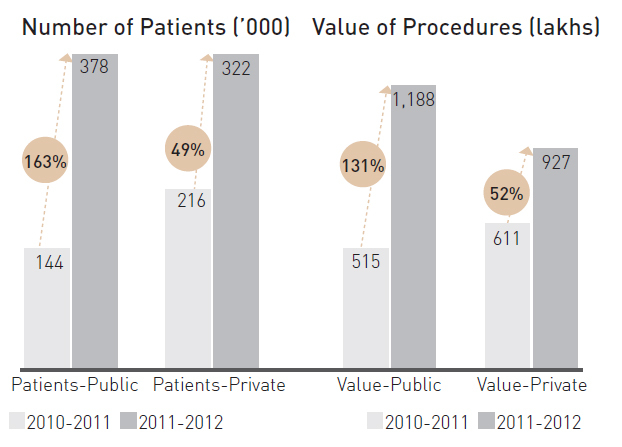 Chart 2 shows some increase in discectomy, laparoscopic appendectomy and laparoscopic cholecystectomy procedures. However, there is no significant growth in other procedures. This could be due to a fall in the overall numbers (owing to a possible reduction in unnecessar y procedures that would other wise have been performed) and also because the reser vation system was initially implemented in only 10 of the 23 districts in the state and extended to all the districts only in 2011. Thus, we need more time- based data to understand the impact of reser vation on public facilities. It is important to note that political economy is a major determinant of the success of any initiative, and since these schemes have such an exaggerated level of political support due to their populist nature, there is an opportunity to use this momentum to advance the health care system in the countr y and strengthen the government’s stewardship role. The major task – to advance primar y care – must be a focus in the coming years. The public and private sectors can learn from the experiences of the National Rural Health Mission and the GSHIs. Public-private collaboration is certainly needed to make a major difference in the sector. This piece aims to encourage government policy makers and the public to assess the current performance and potential of GSHIs from different perspectives. It also hopes to inspire policy makers to use these schemes as tools to influence the quality of ser vices in the private health sector and to strengthen public facilities. Forgia, G. L., and S. Nagpal. “Government Sponsored Health Insurance in India: Are You Covered?” Washington D.C: The World Bank, 2012. Health Survey and Development Committee. “Report of the Health Survey and Development Committee.” Delhi: Manager of the Publications, 1946. Kumaranayake, L. “The Role of Regulation: Influencing Private Sector Activity Within Health Sector Reform.” Journal of International Development 9. 4 (1997): 641-649. MoHFW, Government of India. Third Common Review Mission Report (draft). New Delhi: Ministry of Health and Family Welfare, Government of India, 2009. Rao, M. G., and M. Choudhury. “Health Care Financing Reforms in India.” Working Papers 12/100. National Institute of Public Finance and Policy, 2012. Roberts, M. J., W. Hsiao, P. Berman, and M. R. Reich M. R. Getting Health Reform Right. New York: Oxford University Press, 2004. Tangcharoensathien, V., S. Limwattananon, W. Patcharanarumol, C. Vasavid, P. Prakongsai, and S. Pongutta. “Regulation of Health Service Delivery in the Private Sector: Challenges and Opportunities.” Technical Paper 8. Sponsored by the Rockefeller Foundation. Washington D.C.: Results for Development Institute, 2008. 1CHIS in Kerala was initiated jointly by the Department of Labour and Rehabilitation, the Ministry of Health and Family Welfare Rural Development Department (RDD) and the Local Self Government Department (LSGD) in 2008 to extend the coverage of the central scheme RSBY to families living below the poverty line but that were not yet covered. 2The Comprehensive Health Insurance Agency of Kerala is an autonomous trust formed for the administration of the RSBY-CHIS and CHIS plus schemes in Kerala. 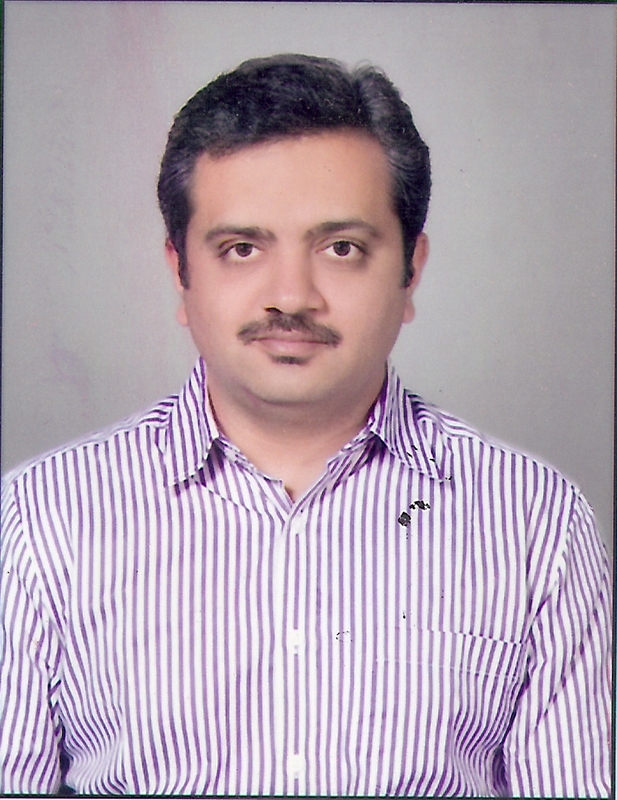 Director (Research), India for ACCESS Health International, Centre for Emerging Markets Solutions (CEMS) at the Indian School of Business (ISB). 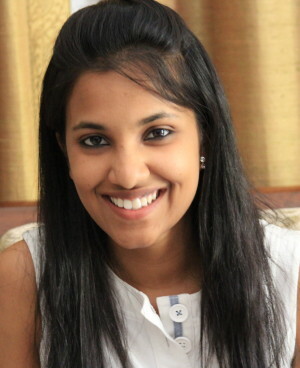 Program Manager at ACCESS Health International, Centre for Emerging Markets Solutions (CEMS) at the Indian School of Business (ISB).